Thanksgiving was a chance to introduce four Germans to the very American custom of overeating in late November. Or at least that’s what we seem to have accomplished. One of our guests called our meal ‘obscene,’ and I think we’re all still recovering from that. We invited some characters to our Friday night presentation of a Thanksgiving meal. These included two old friends of M’s brother, who happened to be visiting us for work and for the occasion. His friend Uwe is full of wit, strong opinions, and a propensity to combine the two traits to put someone in their place when he sees fit. His niece, who lives with him, joined us after work, and before she arrived he said, remarking on the open seat next to him, “I don’t want to sit next to her; I have to see her every day,” which rattled us slightly but as M let her in the front door I slid over towards the miffed guest so he wouldn’t have to sit by her. Another old friend is an endearing architect with a young face yet nearly white hair swept up in a ponytail. She frequently apologizes for her rather good English, but she tends to be quieter than her tall, handsome partner, Doris. Doris carries her own strong opinions and tangled with Uwe at least once over the dinner about the age of St. Paul’s Cathedral in London. M’s brother and my sister were in our flat much of the day helping prepare the meal. We did not track down a turkey, but not because they aren’t to be found; on the contrary, with the former American sector of the city still overrun with Americans, there are plenty of shops catering to the poultry preferences of Americans. M, the primary cook in the house, finds turkeys to be more work than they’re worth, and my passion for the smell of a house filled with the smell of roasting turkey was not enough to sway him to make one. “You don’t even like turkey,” he told me, and he may be right, but oh, that smell. I do miss it. Instead we had baked chicken with a maple syrup vinegar reduction. Maple syrup is hard to come by in Germany, but they offer a thinner ahorn syrup that approximates it. We also had mashed potatoes and stuffing and baked leeks and glazed carrots and Brussels sprouts and rolls and cranberry sauce and yes, there were a lot of dishes on the table. It was more food than we could eat, but in part that was due to a misunderstanding between M and his brother as to who was in charge of buying the vegetables; in the end, they both did. So we made more than we’d intended, but we did plan all those dishes. Those of you who are American and reading this may be thinking, what’s so extravagant about that? Knowing him, he meant it as a joke, but a rather German joke, biting, truthful, a wee bit disparaging. One of us asked if any of our German guests had ever celebrated Thanksgiving before, and it turned out that none of them had. They didn’t know anything about its history. 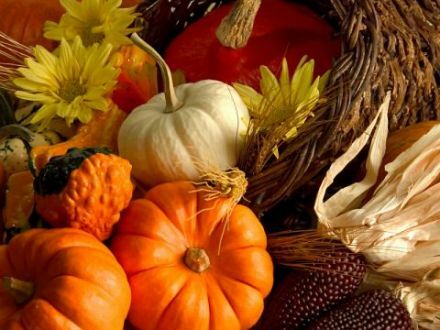 M’s brother did his best to explain the origins of the holiday, noting that the Pilgrim settlers might have starved to death had the Native Americans not taught them how to plant and harvest local crops; the meal was a celebration to share the abundance at harvest time and give thanks. I waited for the cynical recasting of Thanksgiving, a wry comment on how the settlers actually treated the First Nations, but it did not come. The Germans accepted the straight story. Though we’d stuffed ourselves with the meal, there was dessert waiting on the counter, one large apple pie I’d managed to make, and a whipped cream concoction made by Birgit. Making a pie in the flat was interesting, to say the least, because we don’t have a rolling pin and we had nothing close to a pie plate. I knew I could use a wine bottle to roll out the dough. But a pie plate? All we have in our cupboards are skillets and pots. Worst case, I figured I could make a pie in the cast-iron pot shaped like a rowboat that was a decorative piece on the kitchen shelf. But that would be my last resort. First I asked a neighbor upstairs if I might borrow a pie plate, and she invited me in to look through her kitchen equipment. I knelt down on her floor and pulled out the drawers and sifted through bundt pans and molds for banana bread and springform pans, but I could find nothing even remotely close to what I needed. “You must be more of a cake baker,” I said, and she murmured some sort of assent. “Don’t worry, I’ll call a friend down the block,” I told her, and I called Birgit and left a message asking if I might borrow a pie plate. Oh! It hadn’t occurred to me that pie might be unheard of here. There are a thousand fabulous pastries in Germany, but come to think of it, I have not yet seen a slice of pie, nor a whole one, anywhere. I explained what I was looking for, and she said she had something that fit the description, but it turned out to be more of a tart pan, about 14 inches wide and very shallow. It would have to do, as my ball of dough was already sitting in the fridge, waiting for a receptacle. I rolled it out with my wine bottle first thing the next morning, and piled in my sliced apples and sugar and spices and by some miracle rolled out a perfect top to lay across it. The pie made me feel like a tried-and-true American. I thought about past Thanksgivings when I have asked people to go around the table and say what they were thankful for, and maybe I should have done that here. It might have helped our German friends see that the holiday for us is not simply a plethora of dishes, but also a chance to reflect on all that we have to be thankful for. I know that I am thankful for this year abroad, this chance to let go of so much and see what remains. I am also thankful for the chance to share stories with those of you who take time out of your busy lives to read them. I am grateful for all of you. This entry was posted in Sabbatical and tagged Apple pie, German, Germany, London, Thanksgiving, United States on December 4, 2013 by Jill M..
And I am grateful for you, Jill, and thankful to be able to read your wonderful posts. Thanks, Mary Carlton. With Deb here, many stories from our days in Mount Airy have come up, including memories of fun times with the Lulls. Happy Advent season to you. I think it’s the carving of the roast beast that worries him most! a wonderful depiction of a Thanksgiving in Germany. You should have insisted on the gratefullness – part. It would not have done any harm to your German friends to reflect on what they can be grateful for! This is such a wonderful habit, and don’t we all have good reasons to be grateful, if we only take a moment to thing about it? We do, you’re right. I waited too long and the moment for reflection seemed to have passed before I had a chance to bring it up.